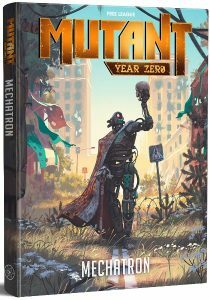 Today we’re really pleased to announce the pre-order for Mutant: Mechatron, the second major core book expansion to the award-wining Mutant: Year Zero roleplaying game from Free League Publishing, plus the Mutant: Mechatron card deck and Mutant: Mechatron-7 map pre-orders to enhance your enjoyment of the game. You can also pick up the Mechatron: Robot bundle of all three products. All three Mutant: Mechatron products are available as part of the Mutant: Year Zero collection on Modiphius.net on pre-order for delivery early June, and will also be available in retail from June so please also support your local gaming store and ask for it there! In the Mutant: Mechatron core book, discover a huge facility hidden underneath the ocean, an army of robots continues to carry out the final orders of humanity. Waiting for the humans to return, the work tirelessly in decaying factories. But now, decades after the humans left, something has changed. Some robots have started to express their own free will. Will these self-aware robots save the Collective – or lead it to its final downfall? The cover image of Mutant: Mechatron (top) is painted by none other than acclaimed sci-fi artist Simon Stålenhag, known from his amazing Tales from the Loop artbook while the gorgeous interior art is made by Danny “Dark Mechanic” Morrison. The Mutant: Mechatron-7 Map is a large full-colour map of the robot facility Mechatron-7, and provides a detailed guide to key locations and facilities for your adventures in the Mutant: Mechatron RPG. It comes folded and is displayed in a large 39.5cm x 55.8cm format.